The partially finished hull and superstructure of the Viudes 45m arrived at Mondo Marine yesterday. 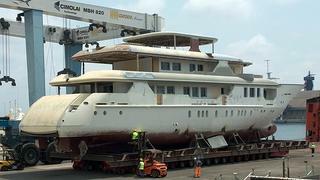 The yacht will be completed by the Repair and Refit Division of the Italian yard. The Viudes 45 started her life in Barcelona a couple of years ago, and was supposed to be the flagship of this Spanish yard. Initially scheduled for delivery this year, the hull was shipped to Italy this week. Lloyd's registered and MCA compliant, this 44.80m motor yacht is designed by Isonaval Naval Architects. Her voluminous interior was initially designed by the in-house Viudes team. Her layout accommodates 12 guests in a full-beam master suite with private balconies on the main deck, and five other cabins on the lower deck: a full-beam VIP, two doubles and two twins. On the technical side, she's powered by twin 1,320hp Caterpillar engines giving a top speed of 15 knots, a cruising speed of 14.5 knots and a range of 5,000 nautical miles at 12 knots. The Viudes 45 has now joined the five other projects under construction at Mondo Marine. Her new delivery date is now scheduled for 2012.